Country: Ireland | Beer Apprentice - Craft Beer News, Reviews, Interviews and Info. Hi guys. For today’s craft beer review I’m going to be sipping on a Guinness Extra Stout produced by Guinness Ltd. located in Dublin, Ireland. Guinness really needs no introduction, so let’s just get to the website, guinness.com, to see what it has to say about this beer. This beer comes in a 12 oz. bottle and it has an ABV of around 6.0%. The Extra Stout poured a deep brown to black color with some easily noticeable ruby highlights around the edges. The crown was light tan in color. It was decently sized, smooth, soft and creamy. The retention time was only so-so, but the lacing seemed alright though. Within the aroma I found some prevalent roasted grains with a slight touch of chocolate. I also detected some type of toasted nuttiness. Almost burnt even. Some very light earthy/herbal hops were accounted for also. Not too bad, however not quite as good as I remember it being in the past. The taste brought forth a very pungent roasted grain. Some toasted breads along with a light burnt coffee bean savor. The chocolate was very subdued. Again, quite earthy and herbal with a touch of bitterness. Hints of dried walnuts as well. After a few minutes the roasted grain became the dominating characteristic and it began to get a tad distracting to be honest. The mouthfeel was medium bodied, smooth, dry and slick. The carbonation seemed good enough and a decent amount of flavoring was left behind on the palate after each sip. Well. It’s been sometime since I last had this beer and, honestly, I don’t find it to be as pleasing as I once did. It’s still a decent brew however. The drinkability was fairly good I must say even with the unfavorable and strong burnt grain taste. It wasn’t too filling or anything. It sort of reminded me of a heavily roasted Brown Ale. I don’t know. It could have just been me. 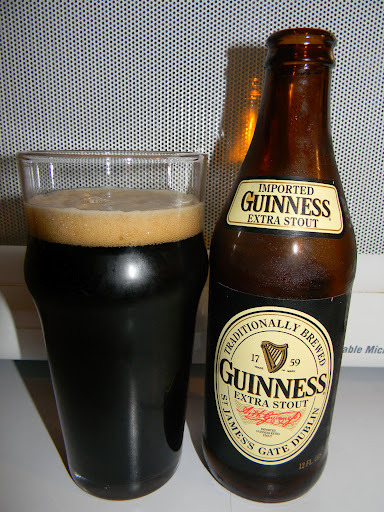 With the plethora of Stouts that are on the market today, I feel that the Guinness Extra Stout falls a bit short in terms of aroma and flavor. That’s not saying that it’s bad or that I wouldn’t drink it if it were offered, however if I wanted a great Stout for an evening of sipping, I doubt that I would reach for this one. Don’t take my word for it though. Pick up a bottle and see what you think. I would really like to hear another opinion. For today’s craft beer review I’m going to be drinking a beer that was one of the first craft brews that I ever had and one that I thoroughly enjoyed back in the day. I’m speaking of the Smithwick’s Imported Irish Red Ale brewed by Guinness Ltd. St. James Gate in Dublin, Ireland. Smithwick’s used to be brewed by the Smithwick’s Brewery in Kilkenny, Ireland, however it was closed and now Guinness (guinness.com) has full reign over this product. Here’s the commercial description for the Smithwick’s Imported Irish Red Ale. It’s been a few years since I last had this beer, so I’m sure that my tastes have changed somewhat, but I’m hoping that I still find it enjoyable. This beer has an ABV of 4.5% and comes in a 12 oz. bottle. The appearance was a very clear, dark amber to ruby red color with a very light tan head attached. The crown was considerably sized, fluffy, soft and somewhat creamy. The retention time and the lacing were only average. The head broke down quicker than I had hoped and the lacing slid down the glass speedily. The aroma started with plenty of roasted malt. Some tones of light nuttiness combined with a fair amount of caramel sweetness. As the brew began to warm I detected a distinguishable graininess that I didn’t find all that appealing. I don’t recall it being that “forward” in times past. 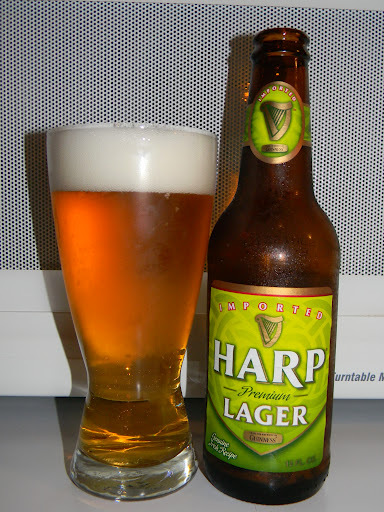 Within the taste I found even more of that heavy graininess combined with savors of butter, bread and some dark malts. A little tickle of sweetness was stumbled upon in the form of those caramel malts and I also noticed that it had a tiny bit of a hop bite. Much like the smell, as the brew began to warm, the graininess really started to overpower the flavor and become unpleasant. Hmm. The mouthfeel was medium, smooth and mostly crisp. I actually thought it to be considerably watery. The flavor vanished from my palate hurriedly. 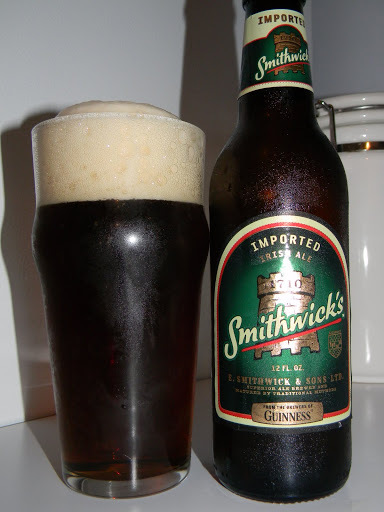 When I first started drinking craft beer I really, really liked the Smithwick’s. Well, no longer do I find this to be a beer that I would run to. I do still think that it looks nice in the glass, however the aroma, taste and mouthfeel have little impact on me now. They just seemed to be lackluster. Some may find this brew to be wonderful…. and that’s great, but I doubt that I will go looking for it again in the near future. I can definitely drink it, although I would probably be looking for something else to try after 1 pint. Have any of you had the same experience with a “gateway” beer that you once loved??? Thanks to everyone for reading and commenting. I’m enjoying all the feedback and comments. Keep ’em coming.